Upgrade your workbench from simple assembly table, to paint station by just adding a spool of paper to one end. I’m making some upgrades to my She-shop right now and one item I wanted to incorporate was a painting station. I know, I know; it’s a workbench – you can get paint on it. 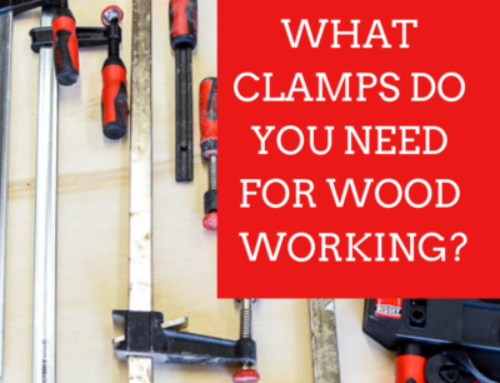 But really you can’t – not if you want to use the same work table for building and sanding as well. It’s surprising how much paint – yes, dried paint – gets transferred to your projects with even the slightest bit of pressure. Corey over at Sawdust 2 Stitches built an amazing painting table using some old cabinets she picked up and by incorporating a spool of paper onto the workbench. You know I had to have one! 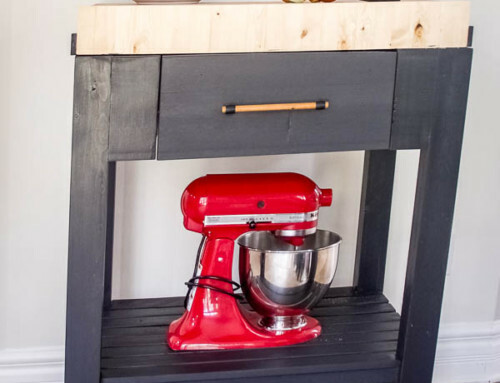 Fortunately, this project really only requires 3 pieces of scrap wood and a large dowel to create your own functional (if not quite as pretty as Corey’s) paint table. I pulled two pieces of ¾” plywood out of my scrap pile and cut them down to 11″ long by 3 ½” wide. I picked up a roll of dry sheathing at my local home improvement store and measured the diameter of the roll. I marked that onto my plywood pieces, found the centre and then drilled a 1 3/8″ hole (with a spade bit) at that mark. The dowel I purchased was 1 ¼”, so the 1 3/8 was just slightly larger for a smooth fit. I notched out a section on one of my plywood boards, thinking that I could thread the dowel in on one side and then just drop it in place on the other. It’s true, it works, but really you could just leave a hole in both pieces of plywood and thread the dowel through both – up to you. I attached the plywood pieces directly to my workbench using 2 ½” construction screws, making sure that enough was sticking out to hold the roll of paper. I fit the dowel through the new workbench upgrade brackets and marked where I should cut. Both the dowel and the dry sheathing paper got cut on my mitre saw – the dowel about 2 ½” longer to allow for a little overhang. I should warn you, cutting this dense roll of paper did cause a fair amount of smoke – so cut carefully and stop to let the blade cool if need be. I turned my roll and cut a third at a time. 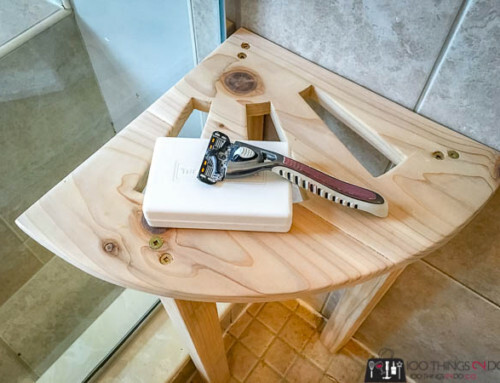 Next you’ll want to cut a third piece of scrap wood to cover the expanse of your workbench and attach either to the top of your workbench or to the new spool hangers we put on either side. I found a piece of trim from an earlier project, so I decided my workbench upgrade was going to be fancy-schmancy (mainly because there’s almost nothing else I can do with a scrap piece of trim this small lol). To allow for your paper to thread underneath your trim piece (or whatever you used), you’ll want to insert a washer or two to create a space. One washer might have been plenty, but I didn’t want to futz around with anything that was difficult to thread later on, so I used two. 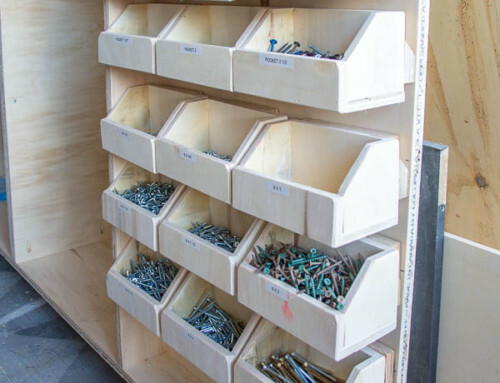 Pre-drill through your trim and down into your bench, then attach the trim, through the washers, into the workbench with a 1 ½”-2″ wood screw (depending on the thickness of both your workbench and the cross piece). Thread your paper through and you are done! You could add a sharp edge underneath your trim piece if you wanted to be able to rip the paper sharply. Maybe an old hacksaw blade? I keep a utility knife at my workbench so I didn’t really need the extra step for my workbench upgrade. I am in the midst of a workshop makeover though, so since everything was getting a coat of “badass black”, the new addition to my workbench got a coordinating look. And was put to work immediately so I could finish up my shop cabinets. 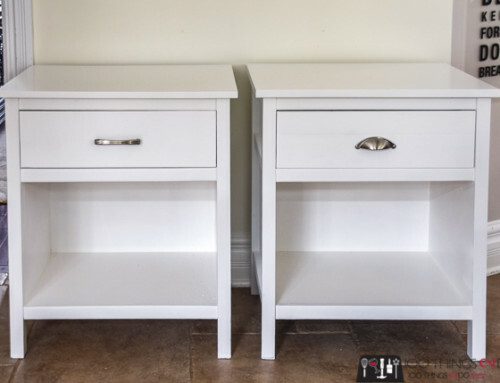 I LOVE how this turned out – the perfect upgrade for my She-Shop, and SO EASY to do! My new and improved She-Shop!